A search team pulled the bodies of two young brothers from a lake on the Red Lake Indian Reservation on Sunday, more than four months after they disappeared, authorities said. The bodies of Tristan Anthony White, 4, and Avery Lee Stately, 2, were found, encased in ice, in First Thunders Lake, about a half-mile from their home. The brothers had been missing since Nov. 22. 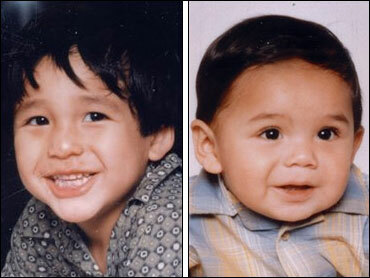 The two boys disappeared while playing outside their home at the remote reservation near the Canadian border. "Today our worst fears were confirmed," FBI Special Agent Ralph Boelter said at a Minneapolis news conference Sunday night. Authorities have not determined whether foul play was involved, Boelter said. "So many people were hoping for the safe return of these boys back home," Red Lake Tribal Chairman Floyd Jourdain Jr. said in a statement late Sunday. "Our thoughts and prayers are with the family in the wake of this disappointing news, and their heartbreaking loss." The lake was initially searched by divers in November, when hundreds of volunteers and law enforcement officers scoured the area for the boys in the days that followed the disappearance with no success. That search was called off five days after the boys vanished, and Boelter said rescuers resumed on Sunday in hopes the warmer weather would help. Police dogs picked up a scent on the southern portion of the lake on Sunday morning and the boys were found in the northern portion of the lake near a beaver dam, Boelter said. Authorities don't know what happened to the brothers. One theory is that the boys wandered from their home about a quarter-mile to the southern edge of the lake, then walked across the partially frozen water before falling through the ice, Boelter said. Alicia White, the mother of the boys, and Jeff Stately, the father of Avery, have both said previously they believed someone abducted the children. The FBI had offered a $30,000 reward for information about the boys, who were featured on an episode of "America's Most Wanted." Authorities plan to conduct an autopsy on the boys in the coming days, which Boelter said could help them determine exactly what happened. "I'm grateful that we found the bodies. Obviously it's very tragic for the families involved as well as the Red Lake Community," Boelter said. The Red Lake reservation is the same place where 16-year-old Jeff Weise killed his grandfather and grandfather's companion on March 21, 2005, then went to the high school and killed seven more people, including a teacher and a security guard, before killing himself.